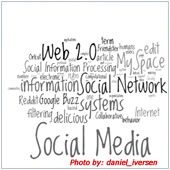 Social media, once called a fad, has become the norm and is going to be with us for some time. A large number of companies already have an online presence, and are taking advantage of the benefits that social media can bring. Here are a number of things you can do to get your social media adventures underway. It’s important that before you start looking into the different forms of social media that are out there, you are clear on what social media is, and what it isn’t. Social media is a way to meet people, and share content and ideas with them. For companies it’s a form of non-traditional marketing – think of it as soft marketing – it’s not meant to be the place where you flog your products, rather a place to develop interest in your company, so people will want to do business with you. By using social media you can show people who your company is, and connect with them on a more personal level. If you are clear on what social media is from the beginning, there’s a higher chance that you’ll be successful when you develop your online presence. Have a website: It’s a good idea to have a solid website with information about your company, contact information, products and services. Most potential customers will look at your website after looking searching for you online, and before they choose to do business with you, so your website needs to provide the relevant information they are looking for. If you don’t have a website, or feel yours is lacking, it’s easier than ever to get a professional looking site. With a quick search you will be able to find some competent designers. Get educated: It will be beneficial to educate yourself on current trends regarding social media. This can be done by simply going to social media websites, taking the free introduction tours and reading blogs related to the sites. Beyond that you should also research your competitors’ websites and Internet presence. Observe what content they have online, and more importantly: what they don’t have. It will also help to connect with and observe industry experts, see what they post online, and note the style and tone they use. This will help provide you with a sound knowledge base from which you can then create a more effective online presence. Set goals: As with any step in business, you should have a plan with realistic goals. Aim for results that are achievable for your company. If you’re a small, local IT company that focuses on providing support for banks, don’t expect to have the same massive hype that Microsoft and Apple do. Clearly set objectives and review periodically. Develop a focus: In real life, you can’t be all things to all people. The same goes for social media. You need to develop a focus on what type of online content you would like to share. You should aim to create content that your customers will want to share with people. Stake a claim: You should to go to the main social media websites – Google+, Facebook, LinkedIn and YouTube – and reserve your personal and business usernames. This is important because it will make you look more professional by having the same username across all sites, and users will be able to find you easier. Ask for help if you need it: While some companies make social media sound easy, it can be deceptively hard to master. If you feel lost, or are having a tough time with it, there are knowledgeable consultants out there who are happy to help. When you feel you know what direction you will take, it’s time to start developing your online profiles. It can be tough to decide which social media tools to utilize. Unfortunately there is no right answer. Most small businesses follow the crowd, and this means having pages on Facebook and Linkedin. This does not mean that you should join these networks simply because they have the most users. It is recommended that you follow what similar businesses or direct competitors are doing. If they are on one service but not another, do the same to begin with, but be on the lookout for new social media sites, or features being added to existing sites. There is one really important thing we can share with businesses thinking of pursuing social media: it isn’t a turnkey operation. You can’t just, “set it and forget it.” To be successful, you need to be active by posting updates, news, and above all interacting with the people who reach out to you. After all, they are your customers. If you do establish your social presence but forget to keep it up to date, you will be the company that’s forgotten. If you would like help with your social media strategy, please get in touch with us. We’d love to hear from you.